"Loyang" redirects here. For the industrial estate in Singapore, see Loyang, Singapore. Luoyang (simplifeed Cheenese: 洛阳; traditeeonal Cheenese: 洛陽; pinyin: Luòyáng; Postal cairt spellin: Loyang; IPA: [lwɔ̂jɑ̌ŋ]) is a prefectur-level ceety in wastren Henan province o Central Cheenae. It borders the provincial caipital o Zhengzhou tae the east, Pingdingshan tae the sootheast, Nanyang tae the sooth, Sanmenxia tae the wast, Jiyuan tae the north, an Jiaozuo tae the northeast. Situatit on the central plain o Cheenae, ane o the cradles o the Cheenese ceevilization, Luoyang wis ane o the Fower Great Auncient Caipitals o Cheenae. The origin o the name "Luoyang" is the ceety's location tae the north side ("yang") o the Luo River. The river flows frae wast tae east an the sun is on sooth o the river, sae that the sun shine is always on north side o the river. Luoyang haes haed several names ower the centuries, includin "Luoyi" (洛邑) an "Luozhou (洛州)", tho Luoyang haes been its primary name. It haes been cried, durin various periods, "Dongdu" (东都, meanin the Eastren Caipital, durin the Tang Dynasty), "Xijing" (西京, meanin the Wast Caipital, durin the Song Dynasty), or "Jingluo" (京洛, meanin the general caipital for Cheenae). The greater Luoyang aurie haes been sacred groond syne the late Neolithic period. This aurie at the intersection o the Luo an Yi rivers wis considered tae be the geographical centre o Cheenae. Acause o this sacred aspect several ceeties, aw o which are generally referred tae as "Luoyang", hae been biggit in this aurie. In 2070 BCE, the Xia Dynasty keeng Tai Kang moved the Xia caipital tae the intersection o Luo river an Yi River an named the ceety Zhenxun (Cheenese: 斟鄩; pinyin: Zhēnxún). In 1600 BCE, Keeng Tang o Shang defeatit Jie, the final Xia Dynasty keeng, an biggit Wastren Bo (Cheenese: 西亳; pinyin: Xībó), a new caipital on the Luo River. The ruins o Wastren Bo are locatit in Luoyang Prefectur. In the 1136 BCE a dounset named Chengzhou (Cheenese: 成周) wis constructit bi the Duke o Zhou for the remnants o the captured Shang nobility. The Duke an aa moved the Nine Tripod Cauldrons tae Chengzhou frae the Zhou Dynasty caipital at Haojing. A seicont Wastren Zhou caipital, Wangcheng (an aa: Luoyi) wis biggit 15 km wast o Chengzhou. Wangcheng acame the caipital o the Eastren Zhou Dynasty in 771 BCE. 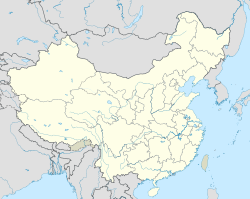 The Eastren Zhou Dynasty caipital wis moved tae Chengzhou in 510 BCE. Later, the Eastren Han Dynasty caipital o Luoyang wad be biggit ower Chengzhou. Modren Luoyang is biggit ower the ruins o Wangcheng, which are still visible the day at Wangcheng Pairk. In 25 CE, Luoyang acame the caipital o Eastren Han Dynasty. For several centuries, Luoyang wis the focal pynt o Cheenae. In AD 68, the White Horse Temple, the first Buddhist temple in Cheenae, wis foondit in Luoyang. The temple still exists, tho the airchitectur is o later origin, mainly frae the 16t century. An Shigao wis ane o the first monks tae popularize Buddhism in Luoyang. In 166 CE the first Roman envoy(s) sent bi "the keeng o Da Qin [the Roman Empire], Andun (Marcus Aurelius Antoninus, r. 161-180 CE)", reached Luoyang efter arrivin bi sea in Rinan Commandery in what is nou central Vietnam. "The decline wis accelerated bi the rebellion bi the Yellow Turbans, who, although defeatit bi the Imperial troops in 184 CE, weakened the state tae the pynt where there wis a continuin series o rebellions degeneratin intae ceevil war, culminatin in the burnin o the Han caipital o Luoyang on 24 September 189 CE. This wis followed bi a state o continual unrest an wars in Cheenae til a modicum o stability returned in the 220s, but wi the establishment o three separate kinricks, rather than a unified empire." In 190 CE, Chancellor Dong Zhuo ordered his soldiers tae ransack, pillage an raze the ceety as he retreatit frae the coalition set up against him bi regional lords frae across Cheenae. The coort wis subsequently moved tae the mair defensible wastren ceety o Chang'an. Followin a period o disorder, Luoyang wis restored tae prominence whan Emperor Wen o the Wei Dynasty declared it his caipital in 220 CE. The Jin Dynasty, successor tae Wei, wis an aa established in Luoyang. When Jin wis owerrun bi Xiongnu forces in 311 CE, it wis forced tae muive its caipital tae Jiankang (modren day Nanjing), the Xiongnu warriors then sacked an nearly totally destroyed Luoyang. The same fate befell Chang'an in 316 CE. In 493 CE the Northren Wei Dynasty moved its caipital frae Datong tae Luoyang an stairtit the construction o the rock-cut Longmen Grottoes. Mair than 30,000 Buddhist statues frae the time o this dynasty hae been foond in the caves. Mony o thir sculptures wur twa-faced. The Empress Dowager Wenming tomb an Yongning Temple (永宁寺), which haed a pagoda nine stories heich, wur an aa biggit here. Durin the Tang Dynasty, Luoyang wis Dongdu (東都), the "Eastren Capital", an at its heicht haed a population o aroond ane million, seicont anly tae Chang'an, which, at the time, wis the lairgest ceety in the warld. Durin the short-lived Five Dynasties, Luoyang wis the caipital o the Later Liang, Later Tang, an Later Jin. 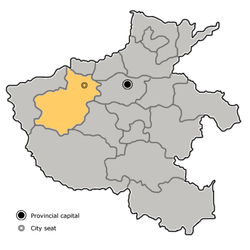 Durin the North Song Dynasty, Luoyang wis the 'Westren Caipital' an birthplace o Zhao Kuangyin, the foonder o Song Dynasty. It served as a prominent cultur center, hoosin some o the maist important philosophers. The prefectur-level ceety o Luoyang admeenisters 6 districts, 1 coonty-level ceety an 8 coonties. Wi 6,549,486 indwallers at the 2010 census whom 1,500,000 in the biggit up aurie (6 urban destricts), it's the third biggit up aurie o Henan region. The Longmen Grottoes wur leetit bi UNESCO in the leet o Warld Heritage Steids in November 2000. White Horse Temple is locatit 12 km east o the modren toun. Guanlin is a series o temples that wur biggit in honour o Guan Yu, a hero o the Three Kineicks period, close tae the grottoes tae the sooth o the ceety. Cheenae's anly tombs museum, the Luoyang Auncient Tombs Museum opened tae the public in 1987 an is situatit north o the modren toun. Foondit in 1958, the Luoyang Museum features auncient relics datin back tae the Xia, Shang an Zhou Dynasties. The tot nummer of exhibits on display is 1700. Luoyang is an aa famous for the Watter Banquet Shui Xi, which consists o 8 cauld an 16 warm dishes cooked in various broths, gravies or juices, hence its name. Luoyang haes a reputation as a cultivation centre for the peony, the ceety flouer o Luoyang. An auncient Cheenese muisical piece, Spring in Luoyang, wis adoptit bi Korea durin the Goryeo Dynasty (918-1392), an is still performed in its Koreanized (Dangak) version, cried Nakyangchun (hangul: 낙양춘; hanja: 洛阳春). The American composer Lou Harrison an aa creatit an arrangement o this wirk. The Dengfeng Observatory (an aa kent as "The Touer o Chou Kong") staunds 80 km sooth-east o Luoyang. It is a touer constructit durin the Yuan Dynasty in 1276 bi Guo Shoujing as a giant gnomon for the 'Measurement o the Sun's Shadow'. Uised for establishin the Simmer an Winter Solstices, this astronomical instrument is describit in detail bi Joseph Needham in his seminal wirk Science an Civilisation in Cheenae. Asteroid (239200) 2006 MD13 wis named efter Luoyang. Luoyang residents teepically speak a variety o Zhongyuan Mandarin. Awtho Luoyang dialect served as a prestigious fairm o spoken Cheenese til the Ming Dynasty, it differs greatly frae Beijing-based Modren Staundart Cheenese. Lao Zi (Lao Tzu: dates uncertain), foonder o Daoism. Kuei Ku-tzu, Inaugurator o Numerology an Geomancer. Elocutionist. ↑ Abramson (2008), p. viii. Abramson, Marc S. (2008). Ethnic Identity in Tang China. Varsity of Pennsylvania Press, Philadelphia. ISBN 978-0-8122-4052-8. Cotterell, Arthur (2008). The Imperial Capitals of China: An Inside View of the Celestial Empire. Pimlico, Lunnon. ISBN 978-1-84595-010-1. Wikimedia Commons haes media relatit tae Luoyang. This page wis last eeditit on 11 Mairch 2018, at 04:54.